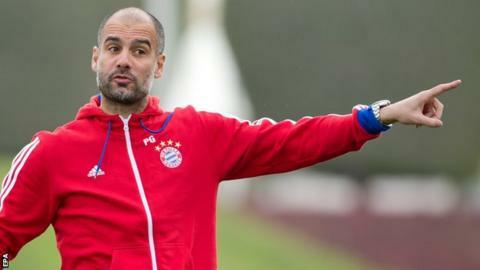 Bayern Munich coach Pep Guardiola says he is happy to wait until the end of the season to discuss a contract extension with the German champions. The 44-year-old, whose current deal ends in June 2016, took over at Bayern in January 2013 and won the Bundesliga and German Cup in his first season. They are currently 11 points clear at the top of the German league. "We still have time to talk about that [contract extension] after the end of the season," said Spaniard Guardiola. "It was a big challenge for me [to work at Bayern]. I have had a great time and it was a dream come true to be Bayern coach." Bayern have been unequivocal in their desire for the former Barcelona player and coach Guardiola to remain at the club. "I have total confidence in the man," said Bayern chairman Karl-Heinz Rummenigge. "My opinion of him is well known, I hope he stays at Bayern for as long as possible. He still has one-and-a-half-years on his contract and that is like light years for him." Guardiola won 14 trophies in four seasons as Barcelona coach from 2008 until 2012, including the Champions League on two occasions. Bayern return to Bundesliga action on Friday after the German winter break with an away game at second-placed Wolfsburg (19:30 GMT).